Follow these steps if you will be using multiple computers to run your meet on TouchPad. If you are still using Windows XP, PLEASE upgrade as Microsoft and TeamUnify no longer support it. 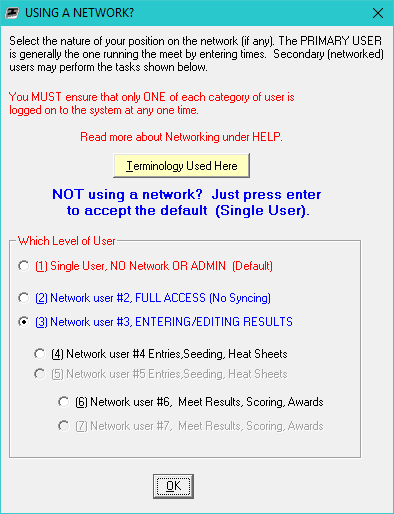 Nevertheless, we have a Networking TouchPad on Windows XP guide. TeamUnify STRONGLY recommends using wired Ethernet connections between the computers. Wireless networks are problematic and difficult to set up. You will need some kind of router, hub or switch to connect all the computers together, such as the one pictured below. Simply attach one end of an Ethernet cable into the Ethernet jack on a computer running TouchPad, and the other end into one of the jacks on the networking device. Do this for every computer in the network. These steps are for Windows 10; they will be similar for other Windows versions. Additional help for Mac users using Parallels is below. In order for your other computer operators to access your meet, you must share your TouchPad folder. On the main TouchPad computer, open File Explorer. Navigate to This PC > Windows (C:) > TeamUnify. 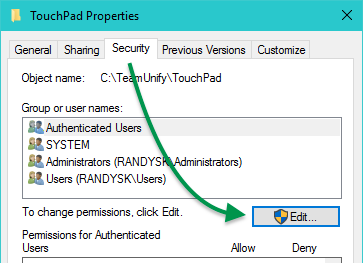 Right click the TouchPad folder and click Properties. 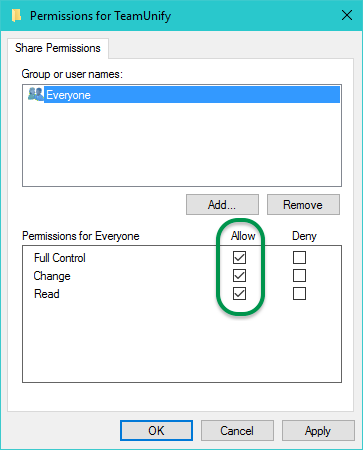 If the Group Everyone does not exist, click Add..., type Everyone in the box and click OK.
Click Everyone and check all the boxes in the Allow column. 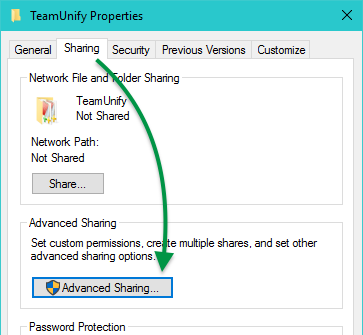 Click OK, and click OK on the Advanced Sharing dialog. 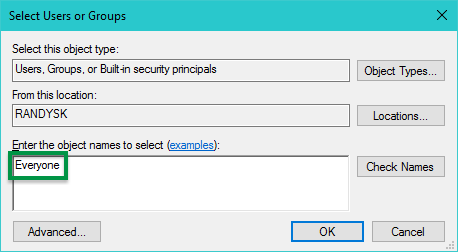 You should be back on the TeamUnify Properties dialog. Click the Security tab. 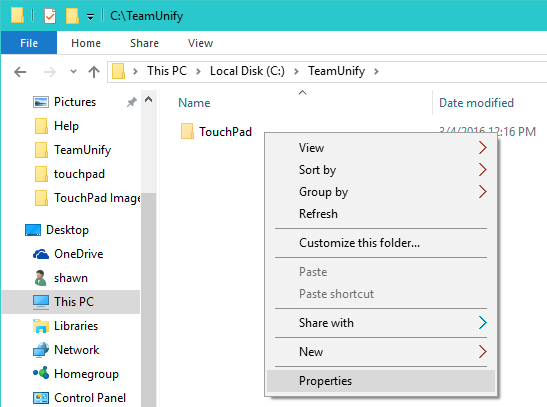 Type Everyone in the box and click OK.
Click OK, and click OK on the Permissions for TeamUnify dialog. The other computer operators will need to know your computer name to find and connect to it. Click Start (Windows logo in lower left) > Settings (in Windows 8.1, open the Start screen, click the down arrow in the lower left, click PC settings). Click About (PC info in Windows 8.1) and note your PC name. In TouchPad, note the MEET # in the upper left of the title bar. The other computer operators will need to find this data meet # folder on your computer. In TouchPad on a secondary computer, click File > Network Management. Select its role, 2, 3, 4 or 6, and click OK., then click OK on the next dialog. In the Open dialog, click Network on the left. Locate the main TouchPad computer's name in the right panel and double click it. Double click the TouchPad folder. Double click the data folder with the MEET # in it (from C above), such as data73. Double click the MDB file of the same same, again such as data73. Important: It’s critical that you are not on the same event with another operator at the same time, as one will overwrite the other. Remember, to write your changes to the meet you must move to the next selection you are working on. This pushes the update to the other operators. If you are having troubles with your Macs finding the shared folder, follow the below steps on all Macs to form a bridge. In the Parallels Desktop Control Center window, click the gear icon. 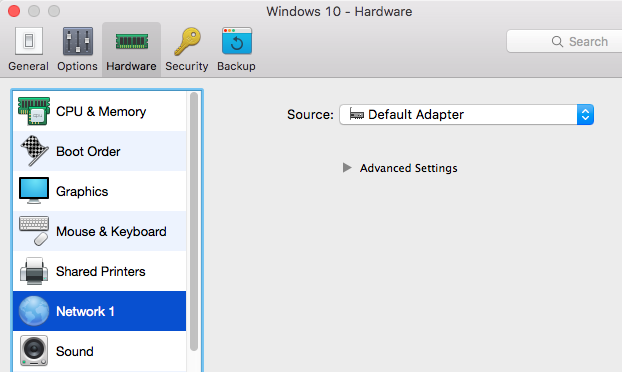 In the Source drop down (or Type in Parallels v10 and older) select Default Adapter. Check the Connected check box if it appears (Parallels v10 and older). Restart Windows to use the new setting.